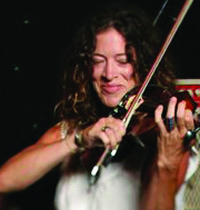 Crista began Suzuki violin lessons at the age of 3 in New Ulm, MN. Recently, she completed graduate work at the University of Minnesota, in Suzuki Pedagogy where she completed teacher training in all 10 Suzuki Books from master teacher, Mark Bjork. Crista also studied music and English at Minnesota State University, where she was a scholarship recipient for four years. Currently teaching at the String Academy of Southern Minnesota, The Mankato Suzuki School and her own program in Waterville and Waseca, MN, and has previously taught at the New Ulm Suzuki School. Crista has also taught elementary music at Hanska Charter School, Sacred Heart Elementary School and St. Theodore School in Albert Lea. She has been a member of the Mankato Symphony Orchestra since 1994, and can be seen sharing the stage with several regional bands such as Lightning Flats, the Blue Ringers and Church of Cash where she sings and plays violin. Crista has coached sectionals with the Upper Midwest String Conference and the New Ulm Youth Orchestra Summer Camp and is a member of the Suzuki Association of Minnesota as well as the American Suzuki Association. Teachers of influence and study include; Nancy Lokken, Joanne Melvin, Mark Bjork, Joanne Bath, Paula Anderson, Marilyn O’Boyle, Adrian Lo, Jim Riccardo and Charles Grey. In her free time, Crista is also a graphic designer, enjoys biking, running, reading, and gardening. She currently resides in rural Waterville with her husband Tom Little.